Entries from Digital Intelligence tagged with "media broadcasting tv and radio"
This weekend's England football international will be broadcast exclusively live over the internet for the first time. Media group Perform is to stream Saturday's away clash against Ukraine on a pay-per-view basis, charging viewers from £4.99 to watch the game live on their PCs or laptops. A maximum of one million subscribers would be taken for the match. This is the "safe number to stop at to ensure the optimal broadcast” the company said. Perform streams more than 15,000 events a year, with millions of site users a month. The move follows the collapse of pay-TV platform Setanta earlier this year, which had been due to broadcast the World Cup qualifier. BBC to offer iPlayer platform to rival broadcasters? The BBC has said its iPlayer online video platform could be opened up to rival broadcasters. The broadcaster revealed the plans last week at the IBC 2009 conference in Amsterdam. Eric Huggers, BBC director of future media and technology, said in a speech at the event the corporation is planning to create an "Open iPlayer" which would allow third parties to offer content on their own versions of the service. Former Eurosport UK managing director Pierre-Jean Sebert has been appointed CEO of Arqiva’s new video-on-demand service that will be built on the infrastructure of the former Project Kangaroo. The transmission company plans to use the assets to launch a new video-on-demand service to UK consumers in the coming months. Project Kangaroo was the video-on-demand (VOD) platform developed by UKVOD LLP, a joint venture set up by BBC Worldwide, ITV and Channel 4. According to DVR Research Institute, 20% of US viewers will actively skip TV ads by 2011 (from 6% currently), as DVR sales continue to rise, writes Media Life. 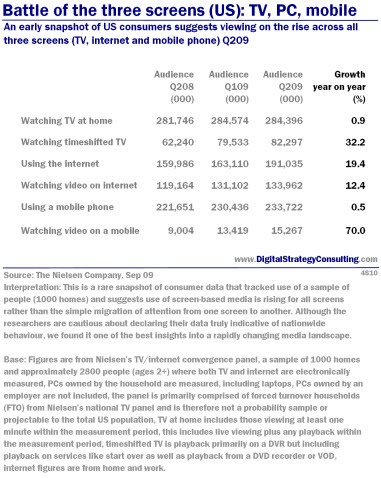 The firm estimates that DVR-enabled households will grow to 50% during the same period, from about a third in 2009. 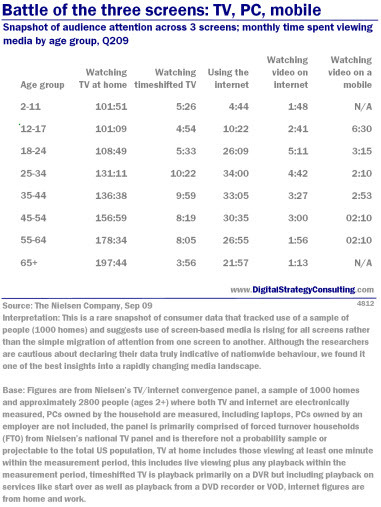 DVR Research Institute also notes that viewers are more likely to skip ads the longer they use their devices. Rival data from Leichtman Research Group suggests that the 50% ownership level won't be reached until 2012 with ad skipping growing to 16%. However, both studies agree on the general trend, as do marketers: 83% now believe that the growing ownership of DVRs will hit the effectiveness of TV campaigns. discussion forums and community tools for musicians to link to events. The partnership complements the launch of the Vodafone Music Reporter platform on MySpace last year and reflects Vodafone's ongoing strategy to brand itself as a "key player in the music industry". MySpace has had a tough time this month, announcing staff cuts of nearly 30% as the site restructures itself to try and play catch-up with Facebook and Twitter. Virgin Media broadband customers will soon have unlimited access to Universal Music's entire back catalogue for a set monthly subscription, writes Marketing Magazine. Users of the service will pay around £20 a month and will be able to stream and download as much music as they want without limits. Users will be able to keep any MP3 files they download and play them on any compatible device without restriction. Virgin Media is currently in talks with other major record labels to try and sign up further partners before the service goes live later this year. Virgin Media also intends to offer a cut-price "entry level" subscription for people who do not require unlimited access. Ofcom's latest research has found that 22.2m UK households now have digital television services on their main TV set, writes Brand Republic. The latest Digital Television Progress Report also found that multi-channel TV take-up grew from 86.1% in Q3 2007 to 87.6% in Q4. 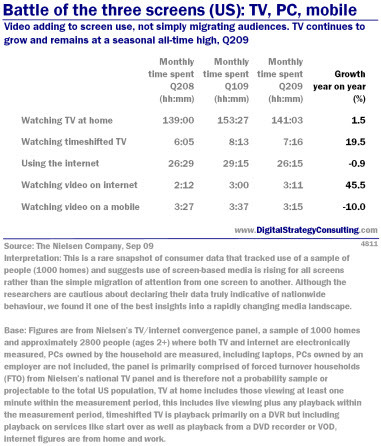 Growth was driven by sales of digital terrestrial TV, with 4m units sold during the final quarter of 2007. Over 4m Freeview units were sold during the period, up from 2.4m in Q3 2007. 15m UK homes now have at least one Freeview box. BSkyB added 145,000 new subscribers, growing to 8.3m in total. Customers using cable TV services grew 61,000 to over 3.5m in total. Cable overtook analogue TV for the first time, becoming the UK's third largest TV platform with 13.6% of the total TV market. 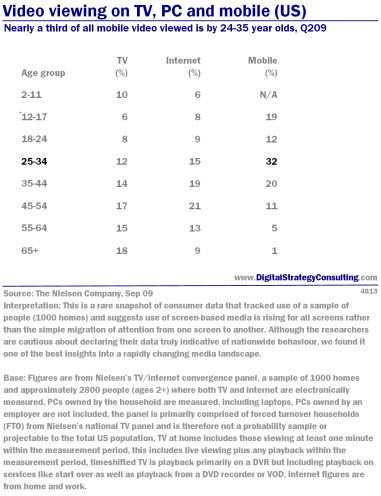 New data from comScore has found that the UK's total audience for online video grew 10% in the year ending January 2009, reaching 29.6m unique viewers (aged 15+), writes Netimperative. 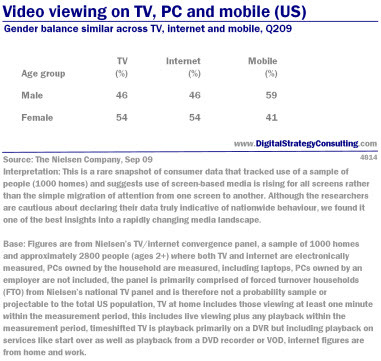 80.1% of the total UK online audience watched a video over the internet during the same period. YouTube accounted for 99% of all videos viewed on Google-owned sites, as the site served over 2bn video requests. In total, Google-owned sites attracted 23.7m online viewers (a 14% increase year-on-year). The BBC came in second place with 6.8m viewers, followed by Microsoft (4.3m) and Facebook (3.6m). Further research from Hitwise estimates that total traffic to online video websites grew 40.7% in the 12 months to February 2009. According to the firm 1 in every 35 web visits went to a specialist video website during February 2009, compared to 1 in 50 visits the year before. Virgin Media TV subscribers made 516m viewing requests in 2008, including almost 100m views for the BBC's iPlayer service, writes The Guardian. Virgin's on-demand service is now used by 52% of the firm's 3.5m subscribers - up from 47% in 2007. The service provided 56m views in December 2008 alone (up from 33m in Q4 2007). The average number of monthly video views per user has also increased, from 23 to 30 year-on-year. Virgin Media's platform now accounts for roughly one third of all iPlayer views, though the on-demand film service provided by FilmFlex is also proving successful. On-demand film requests, including Iron Man and Indiana Jones, led to a 10% usage rise in December. FilmFlex has racked up 35m sales since launch and offers more on-demand premieres than any other European service. We hope you have enjoyed this year's editions of Digital Intelligence and in this final monthly review we show you how despite tough times on the high street online retail continues to break new records. In China online adspend continues to show extremely strong growth - no real surprise considering the majority of under-25s now spend half their time online. Further news from the broadcasting sector also continues to emphasise how the worlds of television, radio and online continue to converge and blur. Best wishes for the holiday season from all of us here at Digital.